IOT is very hot topic when talking of current technology although it started long ago in 1999 by Kevin Ashton for the company P&G. Kevin cool name na? It reminds me of me ! he-he. Now back to IOT, so basic idea of IOT is to connect dumb things that are around us to a network to make things smart. We can’t make people around us smart but we can makes things smarter irony! You can say you are implementing IOT when you have some sort of (small) processor in your device that has interaction with environment human or animal , device can be multiple there is no limit to numbers here, when these devices are connected to internet of network of any sort that you are doing something with IOT. Sole motive of IOT is to collect and transfer data from one end to another for clarity I would like to include terms like sensors, actuators, processors/controllers, storage. Now sensor is some device that will collect data it will require a local processor to process data or more importantly send data to some storage that will be firebase database in our case. The processor/controllers here will be Arduino NodeMCU, Sensor we are using here is Ultrasonic sensor and one more device LED that will work as are in-house testing device will share processor with ultrasonic sensor. Work of LED will be very simple glow or not glow our ultrasonic sensor will sense nearby object, we can use any sensor depending upon what we would like to monitor or work with here we will sense object and notify user. // Set these to run example. Notifying user will require an interface through which user will get to know what our sensor has to tell us for this we will build an very simple Android app that we have built once for home automation. This app will let display the distance of the object to the sensor and can also be used to generate some kind of alert if it is required. The app will collect data from the firebase that is our cloud storage and this cloud storage is being updated on real time by our Arduino NodeMCU with the help of our Ultrasonic Sensor. 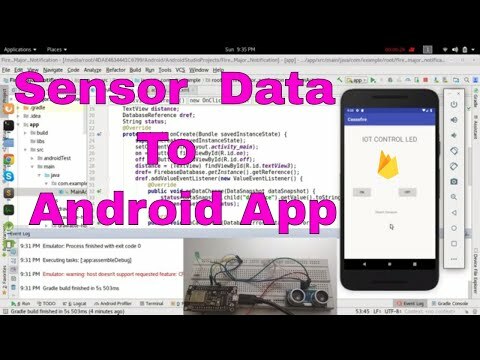 So, that's all for mapping your sensor data to Android app using firebase database and Arduino NodeMCU. Hello there, i am on here for those interested in hack related services like phone taps to catch cheating spouse, email hacks, website hack, credit score repair, funding programs,clear criminal records , proof to help win court cases, DMV or any problem you feel no one can resolve. I met Andrew Alan a hacker who helped me with countless projects that came out succesfully and so i decided to vouch for his service and help increase his client base. If you feel you have anything disturbing you and you neeed someone discreet to help you out??? Contact icefoghackersorg@gmail.com or text +1-616-422-7025. I hope this helps you all on here. how can i add date and time new child added to the database ? i want show sensor data and as well as the date and time when updated the time and date. please respond quickly. Waiting for your positive respond. Unfortunately these factors mean that, in most cases, recovery services are quite expensive. Technician training, hard drive inventories and special equipment all come with a cost.